Genetic diversity is a key feature of a biodiverse planet, and a new study focusing on black rhinos shows just how important this internal trait is to external survival over the long-term. An international team of researchers compared, for the first time, the genes of all living and extinct black rhinos. 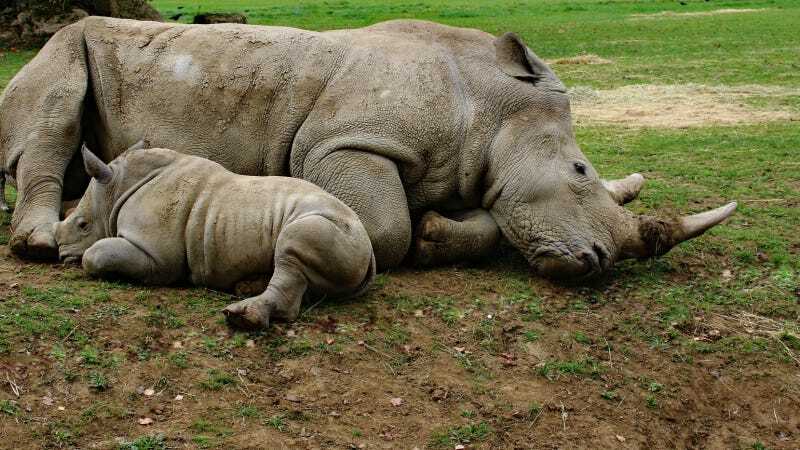 They found that nearly 70% of the rhino's genetic diversity (44 of 64 genetic lineages) has disappeared over the last 200 years due to hunting and loss of habitat. If conservation of genetically distinct populations isn't prioritized, the long-term viability of the critically endangered species, of which fewer than 5,000 remain, could be in even more serious jeopardy. Professor Mike Bruford, from Cardiff University's School of Biosciences and an author on the study, said that with climate change, disease, and land-use change all happening at once, "biodiversity is going to need all the natural resilience it has to overcome the current extinction crisis." "In the short-term, it's a numbers game and you just need enough individuals to survive," he said. "But in the medium-long term, genetic diversity will become more important if those populations survive and we want them to thrive in the highly modified ecosystems we are bequeathing them." Published in the journal Scientific Reports, the study found that while five surviving black rhino gene pools remain, genetically unique populations in countries such as Nigeria, Cameroon, Chad, Eritrea, Ethiopia, Somalia, Mozambique, Malawi and Angola no longer exist. As recently as the 1970s, black rhinos were a common sight throughout most of sub-Saharan Africa, where they numbered up to 70,000. Unfortunately, widespread poaching for the animal's valuable horn took off in the early 1980s, sparking a population collapse. Bruford said they didn't expect the magnitude of the rhino's genetic diversity loss to be so profound. Losing genetic diversity makes it much harder for a species to evolve and adapt to new conditions—or new normals—which the natural world is full of in this human-dominated era known as the Anthropocene, a moment many consider to be the start of the planet's sixth mass extinction. Bruford said that not understanding the evolution of a species is like "inspecting a jigsaw puzzle with 70% of the pieces missing." "You cannot understand whether you have one or more species or more than one conservation population without knowing the whole picture," he said. “Genetic diversity is required for future adaptation to changing environmental conditions such as climate change, emerging infectious diseases, and competition with exotic invasive species." Andrew DeWoody, a genetics professor in the Departments of Forestry & Natural Resources and Biological Sciences at Purdue University, said the study shows that not only has the black rhino gene pool lost “old” mitochondrial variants, but suggests that many younger variants have also been lost and the contemporary gene pool is far more shallow than expected. DeWoody, who was not involved with the study, said that it illustrates how generations-long population crashes that reduce genetic diversity can be very harmful to a species' survival. "Genetic diversity is required for future adaptation to changing environmental conditions such as climate change, emerging infectious diseases, and competition with exotic invasive species," he said. DeWoody believes genetic diversity to be the ultimate measure of biodiversity and a key to long-term conservation. He said while a number of wildlife species, such as the northern elephant seal, have lost most of their genetic diversity and survived in the short term, it's hard to measure how they'll fare on an evolutionary timescale. But he has an educated guess. "If we could do experiments on millennial timescales, I’m quite confident that we’d see lineages with little genetic diversity would not survive as long as those with ample genetic diversity." "If we could do experiments on millennial timescales, I’m quite confident that we’d see lineages with little genetic diversity would not survive as long as those with ample genetic diversity," he said. "To some extent, we see this in nature where clonal organisms have much shorter evolutionary lifespans than sexual species, which have far more genetic diversity." Going forward, the rhino study researchers would like to sequence the entire black rhino genome to see how this loss of genetic diversity is likely to affect future populations. With some populations being targeted more by poachers than others, this information could be critical in conservation efforts and for maintaining fresh breeding practices. The rhino poaching epidemic is so severe that conservationists are considering all options, including flooding the market with synthetic rhino horn. Rhino horn demand is as high as ever; the material is more valuable than gold and cocaine, and can sell for $27,000 a pound or even higher sometimes. Rhino horn is not bone or bony tissue. It’s made of keratin, the same material found in human hair and fingernails. The horns are used for Traditional Chinese Medicine, but the real cause of the price increase is the demand for them to be carved into art objects and jewelry for wealthy patrons. At the start of the 20th century, there were half a million wild rhinos. Today, the total population hovers around 29,000, with the majority of these being the white rhino subspecies. Several rhino subspecies are on the verge of extinction, numbering 100 or less in population. (a) Decreases in black rhinoceros numbers across Africa in the latter half of the 20th century. Dashed lines indicate extant aboriginal populations. (b) Range-wide distribution of the black rhinoceros in sub-Saharan Africa. The rapid plummet of rhino numbers over the last several decades is part of a much bigger trend of wildlife depletion. According to a recent Living Planet report by WWF and the Zoological Society of London, by 2020 the number of vertebrates on Earth (aside from humans) could have fallen by two-thirds since 1970. While there is still time to change course and salvage some of the destruction, these animals have already lost almost 60% of their population over the last 45 years. Over the same period human population doubled from under four billion to around 7.5 billion.